Maxine Waters, Bobby Scott, Elijah Cummings, Barbara Lee and Jim Clyburn support Medicare for All. What is a fair wage for a prisoner’s labor? 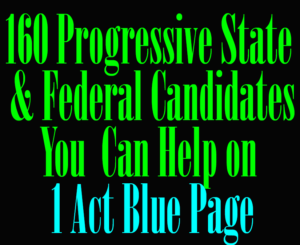 FL-25, WV-01, SC-01, 3 of the 160+ Candidates you have been supporting on – Progressive-Berniecrats-Primary Winners – 160+ Candidates running in 2016 State and Federal Races that YOU can support on 1 ActBlue page – They can use your support today !!! $58,000+ raised in 23,000+ tiny donations so far…….